The Minangkabau ethnic group (also known as Minang or Padang) is indigenous to the highlands of West Sumatra, in Indonesia. The Minangs are the world's largest matrilineal society, with a complex social structure based on matrilineal clans, and property, such as land and houses, inherited through female lineage. Religious and political affairs are the province of men; each village (nagari) is governed autonomously according to adat (ethnic traditions). The Minangkabau are strongly Islamic, but still follow adat, which was derived from animistic beliefs before the arrival of Islam. From 1821 to 1837, their West Sumatran homelands were the location of the Padri War, a conflict between Islamic reformists and traditionalists. The present relationship between Islam and adat is described in the saying "tradition [adat] founded upon Islamic law, Islamic law founded upon the Qur'an" (adat basandi syara', syara' basandi Kitabullah). A cultural tradition of seeking education outside the community has extended the influence of the Minangkabau throughout the Indonesian archipelago. Due to this emphasis on education, Minangkabau are over-represented, in proportion to their numbers, in the public life of Indonesia. In addition to being renowned as merchants, the Minangs have produced some of Indonesia's most influential poets, writers, statesmen, scholars, and religious scholars. Today four million Minangs live in West Sumatra, while about three million more are scattered throughout many Indonesian and Malay Peninsula cities and towns. The Minangkabau ethnic group (also known as Minang or Padang) is indigenous to the central highlands of West Sumatra, in Indonesia. The Minangkabau call their homeland the Alum Minangkabau or “the world of the Minangkabau.” The alum includes darat, territories in the high plateaus of central Sumatra, and rantau, frontier regions stretching down to the coasts of east and west Sumatra. A process called merantau, in which young Minangkabau men travel to frontier territories and even overseas to educate themselves, has resulted in the expansion of Minang influence to many parts of the archipelago. Today four million Minangs live in West Sumatra, while about three million more are scattered throughout many Indonesian and Malay peninsula cities and towns. The name Minangkabau is thought to be a conjunction of two words, minang ("victorious") and kabau ("buffalo"). A legend says that the name is derived from a territorial dispute between the Minangkabau and a neighboring prince. To avoid a battle, the local people proposed that the dispute be settled by a fight to the death between two water buffalo. The prince agreed, and produced his largest, meanest, most aggressive buffalo. The Minangkabau produced a hungry baby buffalo with its small horns ground to make them as sharp as knives. Seeing the adult buffalo across the field, the baby ran to it, hoping for milk. The big buffalo saw no threat in the baby buffalo and ignored it, looking around for a worthy opponent. When the baby thrust his head under the big bull's belly, looking for an udder, the sharpened horns punctured and killed the bull, and the Minangkabau won the contest and the dispute. The roofline of traditional houses in West Sumatra, called rumah gadang (Minangkabau, "big house"), curve upward from the middle and end in points, in imitation of the water buffalo's upward-curving horns. 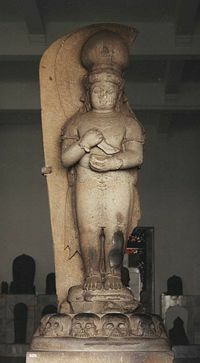 A statue believed to be a portrayal of Adityawarman, founder of a Minangkabau kingdom. People who spoke Austronesian languages first arrived in Sumatra around 500 B.C.E., as part of the Austronesian expansion from Taiwan to Southeast Asia. The Minangkabau language is a member of the Austronesian language family, and is closest to the Malay language, though it is not known when the two languages split from a common ancestor. The precise historical relationship between Malay and Minangkabau culture is unclear. Until the twentieth century, the majority of the Sumatran population lived in the highlands. The highlands are well suited for human habitation, with plentiful fresh water, fertile volcanic soil, a cool climate, and valuable commodities such as gold and ivory. It is probable that wet rice cultivation evolved in the Minangkabau highlands long before it appeared in other parts of Sumatra, and predates significant foreign contact. Menhirs (megalithic standing stones), some with elaborate pre-Islamic carvings, found in some of the highland districts, are evidence of an early connection with Negeri Simbilan, on the Malay peninsula, where similar monuments and close cultural parallels are found. It is generally believed that Minangkabau peoples migrated to Negeri Simbilan sometime before the arrival of Islam in Sumatra during the sixteenth century. The earliest written records of the Minangkabau, stone inscriptions referring to a ruler named Adityawarman, date to the fourteenth century. Adityawarman, a follower of Tantric Buddhism with ties to the Singhasari and Majapahit kingdoms of Java, is believed to have founded a kingdom in the Minangkabau highlands at Pagaruyung, possibly to gain control over the local gold trade, and ruled there between 1347 and 1375. The establishment of a royal system seems to have involved conflict and violence, eventually leading to a division of villages into one of two systems of tradition (laras): Bodi Caniago adhering to the tradition of autonomous rule; and Koto Piliang exhibiting overt allegiances to royalty. The next historical record after the reign of Adityawarman dates from the sixteenth century, and indicates that royal power had been divided among three recognized reigning kings. They were the King of the World (Raja Alam), the King of Adat (Raja Adat), and the King of Religion (Raja Ibadat), and collectively they were known as the Kings of the Three Seats (Rajo Tigo Selo).The Minangkabau kings were charismatic or magical figures, who received a percentage of gold mining and trading profits, but did not have much authority over the conduct of village affairs. In the mid-sixteenth century, the Aceh Sultanate invaded the Minangkabau coast, occupying port outlets in order to acquire gold. Around the sixteenth century the Minangkabau also began to adopt Islam. The first contact between the Minangkabau and Western nations occurred with the 1529 voyage of Jean Parmentier to Sumatra. The Dutch East India Company (VOC) first acquired gold at Pariaman in 1651, but later moved south to Padang to avoid interference from the Acehnese occupiers. In 1663 the Dutch agreed to protect and liberate local villages from the Acehnese in return for a trading monopoly, and set up trading posts at Painan and Padang. The VOC was able to negotiate for gold, but soon found that the Minangkabau rulers in the highlands were highly revered by the people of the coastal regions, who used their authority to assert themselves against the Europeans. In the early eighteenth century, representatives of the Minangkabau royal families helped to lead a holy war against the Dutch. Until early in the nineteenth century the Dutch remained content with their coastal trade of gold and produce, and made no attempt to visit the Minangkabau highlands. As a result of conflict in Europe, the British occupied Padang from 1781 to 1784 during the Fourth Anglo-Dutch War, and again from 1795 to 1819 during the Napoleonic Wars. Late in the eighteenth century, the gold supply which provided the economic base for Minangkabau royalty began to be exhausted. Around the same period, other parts of the Minangkabau economy expanded as new opportunities arose for the export of agricultural commodities such as coffee and the herb gambier used for dyeing and traditional medicine, stimulating social and religious change and bringing new groups into prominence. Tensions had existed for almost two centuries between the two laras, Koto Piliang which upheld the authority of the royal family, and Bodi Caniago, which sympathized with the Wahabbi Islamic reform movement in Mecca and had come into prominence through the coffee trade. A civil war started in 1803 between the Padri fundamentalist Islamic group and the traditional syncretic groups, elite families and Pagaruyung royals. A large part of the Minangkabau royal family was massacred by the Padri in 1815, and their court was burned. The Dutch took this opportunity to assert their military authority. After negotiating a treaty with a number of penghulu (village headmen) and representatives of the murdered Minangkabau royal family, Dutch forces made their first attack on a Padri village in April, 1821. The first phase of the war ended in 1825 when the Dutch signed an agreement with the Padri leader Tuanku Imam Bonjol to halt hostilities, allowing them to redeploy their forces to fight the Java War. When fighting resumed in 1832, the reinforced Dutch troops were able to more effectively attack the Padri. The main center of resistance was captured in 1837, Tuanku Imam Bonjol was captured and exiled soon after, and by the end of the next year the war was effectively over. 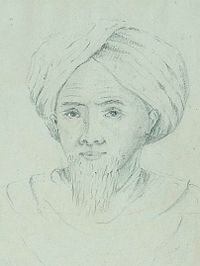 Tuanku Imam Bonjol, a leader in the Padri War. With the Minangkabau territories now under the control of the Dutch, colonial administration began to control the darat, right down to nagari (village) level, in order to secure profits from coffee production. Roads and railways were built to facilitate the transportation of agricultural produce, and economic exploitation was intensified. New forms of education were introduced, allowing some Minangkabau to take advantage of a modern education system. The 20th century marked a rise in cultural and political nationalism, culminating in the demand for Indonesian independence. Later rebellions against the Dutch occupation included the 1908 Anti-Tax Rebellion and the 1927 Communist Uprising. During World War II the Minangkabau territories were occupied by the Japanese, and when the Japanese surrendered in August, 1945, Indonesia proclaimed its independence. Dutch attempts to regain control of the area were ultimately unsuccessful, and in 1949 the Minangkabau territories became part of Indonesia as the province of Central Sumatra. In February, 1958, dissatisfaction with the centralist and communist-leaning policies of the Sukarno administration triggered a revolt which was centered in the Minangkabau region of Sumatra, where rebels proclaimed the Revolutionary Government of the Republic of Indonesia (PRRI) in Bukittinggi. The Indonesian military invaded West Sumatra in April, 1958, and within a month had recaptured major towns. A period of guerrilla warfare ensued, but most rebels had surrendered by August 1961. West Sumatra became like an occupied territory, with Javanese officials occupying most senior civilian, military and police positions. The policies of centralization continued under the Suharto regime. The national government legislated to apply the Javanese desa village system throughout Indonesia, and in 1983 the traditional Minangkabau nagari village units were split into smaller jorong units, thereby destroying the traditional village social and cultural institutions. In the years following the downfall of the Suharto regime, decentralization policies were implemented, giving more autonomy to provinces, and allowing West Sumatra to reinstitute the nagari system. The village of Pariangan, located on the slopes of Mount Marapi, is in folklore said to be the first Minangkabau village. The traditional historiography or tambo of the Minangkabau tells of the development of the Minangkabau World (alam Minangkabau) and its adat. These stories are derived from an oral history which was transmitted between generations before the Minangkabau had a written language. The first Minangkabau are said to have arrived by ship and landed on Mount Marapi when it was no bigger than the size of an egg, which protruded from a surrounding body of water. After the waters receded the Minangkabau proliferated and dispersed to the slopes and valleys surrounding the volcano, a region called the darek. The tambo claims the ship was sailed by a descendant of Alexander the Great (Iskandar Zulkarnain). A division in Minangkabau adat into two systems is said to be the result of conflict between two half-brothers Datuk Ketemanggungan and Datuk Perpatih nan Sabatang, the leaders who formulated the foundations of Minangkabau adat. The former accepted Adityawarman, a prince from Majapahit, as a king, while the latter considered him a minister, and a civil war ensued. 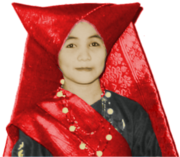 The Bodi Caniago system formulated by Datuk Perpatih nan Sabatang was based upon egalitarian principles with all panghulu (clan chiefs) being equal, while the Koto Piliang system was more autocratic, with a hierarchy of panghulu. Each village (nagari) in the darek was an autonomous "republic," governed independently of the Minangkabau kings using one of the two adat systems. After the darek was settled, new outside settlements were created and ruled using the Koto Piliang system by rajas who were representatives of the king. This tradition has created Minang communities in many Indonesian cities and towns, which nevertheless are still tied closely to their homeland; a state in Malaysia named Negeri Sembilan is heavily influenced by Minang culture. Due to their cultural emphasis on education, Minang people are over-represented, in proportion to their numbers, in the public life of Indonesia. In addition to being renowned as merchants, the Minangs have produced some of Indonesia's most influential poets, writers, statesmen, scholars, and religious scholars. The presence of these intellectuals, combined with the people's basically proud character, made the Minangkabau homeland (the province of West Sumatra) one of the powerhouses in the Indonesian struggle for independence. Today both natural and cultural tourism have become important economic activities in West Sumatra. Batagak pangulu - inauguration ceremony for a clan leader. Other clan leaders, all relatives in the same clan and all villagers in the region are invited. The ceremony lasts for seven days or longer. Tanah Ta Sirah- inauguration of a new clan leader (Datuk), when the inauguration is performed within a few hours of the previous leader’s death. In these circumstances the Batagak pangulu is not required, but the clan must invite all clan leaders in the region. Mambangkik Batang Tarandam, inauguration of a new leader (Datuk) after a long period of ten to 50 years has passed since the death of the previous leader; the Batagak Pangulu must be performed. Traditional Minangkabau music includes saluang jo dendang which consists of singing to the accompaniment of a saluang bamboo flute, and talempong gong-chime music. Dances include the tari piring (plate dance), tari payung (umbrella dance) and tari indang. Demonstrations of the silat martial art are performed. Pidato adat are ceremonial orations performed at formal occasions. Randai, a folk theater tradition incorporating music, singing, dance, drama and the silat martial art, originated early in the twentieth century as a synthesis of local martial arts and story-telling. Randai is usually performed for traditional ceremonies and festivals, and complex stories may span a number of nights. It is performed as a theatre-in-the-round to achieve an equality and unity between audience members and the performers. Randai performances alternate martial arts dances, songs, and acted scenes. The stories are developed by both the acting and the singing, and are mostly based upon Minangkabau legends and folktales. Men originally played both the male and female characters in the stories, but since the 1960s women have also participated. Particular Minangkabau villages specialize in cottage industries producing handicrafts such as woven sugarcane and reed purses, gold and silver jewelry using filigree and granulation techniques, woven songket textiles, wood carving, embroidery, pottery, and metallurgy. The staple ingredients of the Minangkabau diet are rice, fish, coconut, green leafy vegetables and chili. The preparation of meat is limited mostly to special occasions, and beef and chicken are most commonly used. Pork is not halal and therefore not consumed, while lamb, goat and game are rarely used because of their scarcity and for reasons of taste. Spiciness is a characteristic of Minangkabau food, and the most commonly used herbs and spices are chili, turmeric, ginger and galangal. Vegetables are consumed two or three times a day. Fruits are mainly seasonal, although fruits such as banana, papaya and citrus are continually available. Three meals a day are typical, with the mid-day meal being the most important meal, except during the fasting month of Ramadan when it is not eaten. Meals commonly consist of steamed rice, a hot fried dish and a coconut milk dish, with a little variation from breakfast to dinner. Meals are generally eaten from a plate using the fingers of the right hand. Snacks are more frequently eaten by people in urban areas than in villages. Western food has had little impact upon Minangkabau consumption and preference. Rendang, a curry dish using coconut milk, which is considered to be characteristic of Minangkabau culture, is cooked four to five times a year. Other characteristic dishes include Asem Padeh, Soto Padang, Sate Padang, Dendeng Balado (beef with chili sauce). Food has a central role in the Minangkabau ceremonies which honor religious and life cycle rites. Minangkabau food is popular among Indonesians, and restaurants are present throughout Indonesia. Nasi Padang restaurants, named after the capital of West Sumatra, are known for placing a variety of Minangkabau dishes on a customer's table along with rice and billing only for what is taken. Nasi Kapau is another restaurant variant which specializes in dishes using offal, and uses tamarind to add a sourness to the spicy flavor. Rumah gadang in the Pandai Sikek village of West Sumatra, with two rice barns (rangkiang) in front. 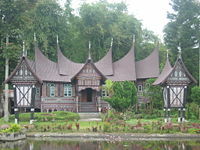 Rumah gadang (Minangkabau: 'big house') are the traditional matriarchal homes (Indonesian: rumah adat) of the Minangkabau. The architecture, construction, internal and external decoration, and the functions of the house reflect the culture and values of the Minangkabau. A rumah gadang serves as a residence, as well as a hall for family meetings and ceremonial activities. The rumah gadang is owned by the women of the family who live there; ownership is passed from mother to daughter. The houses have dramatic curved roof structures with multi-tiered, upswept gables. Shuttered windows are built into walls incised with profuse painted floral carvings. The term rumah gadang usually refers to the larger communal homes; however, smaller single residences share many of the same architectural elements. 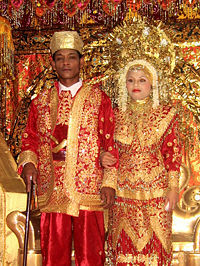 A Minangkabau bride and groom. Minangkabau culture has a long history of oral traditions. One oral tradition is the pidato adat (ceremonial orations) performed by panghulu (clan chiefs) at formal occasions such as weddings, funerals, adoption ceremonies, and panghulu inaugurations. These ceremonial orations consist of many forms including pantun, aphorisms (papatah-patiti), proverbs (pameo), religious advice (petuah), parables (tamsia), two-line aphorisms (gurindam), and similes (ibarat). Minangkabau traditional folktales (kaba) are narratives which present the social and personal consequences of either ignoring or observing the ethical teachings and the norms embedded in the adat. The storyteller (tukang kaba) recites the story in poetic or lyrical prose while accompanying himself on a rebab. 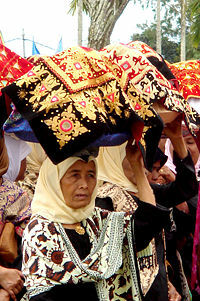 A theme in Minangkabau folktales is the central role of mothers and motherhood in Minangkabau society. Two examples are Rancak diLabueh and Malin Kundang. Rancak diLabueh tells about a mother who acts as teacher and adviser to her two growing children. Initially her son is vain and headstrong, and only after her perseverance does he become a good son who listens to his mother. Malin Kundang is about the dangers of treating your mother badly. A sailor from a poor family voyages to seek his fortune, becomes rich and marries a prestigious wife. On his return home, he refuses to recognize his elderly mother because he is ashamed of his humble origins. He is cursed and dies soon afterwards when his ship is flung against rocks by a storm. Other popular folktales also relate to the important role of the woman in Minangkabau society. In the Cindua Mato (Staring Eye) epic about the traditions of Minangkabau royalty, woman is the source of wisdom. The story involves a mythical Minangkabau queen, Bundo Kanduang, who embodies the behaviors prescribed by adat. Cindua Mato, a servant of the queen, uses magic to defeat hostile outside forces and save the kingdom. Sabai nan Aluih is about a young girl named Sabai who avenges the murder of her father by a powerful and evil ruler from a neighboring village. When her cowardly elder brother refuses to confront the murderer, Sabai takes matters into her own hands, seeks out the murderer and shoots him for revenge. The Minangkabau language (Baso Minangkabau) is an Austronesian language belonging to the Malayic linguistic subgroup, which in turns belongs to the Malayo-Polynesian branch. The Minangkabau language shares many similar words with Malay, yet it has a distinctive pronunciation and some grammatical differences rendering it unintelligible to Malay speakers. The Minangkabau language is closely related to the Negeri Sembilan Malay language used by the people of Negeri Sembilan, many of whom are descendants of Minangkabau immigrants. The language has a number of dialects and sub-dialects, which native Minangkabau speakers generally have no difficultly understanding. The differences between dialects are mainly at the phonological level, though some lexical differences also exist. 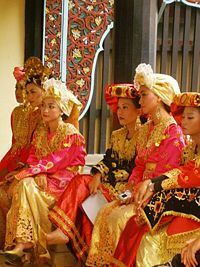 Minangkabau dialects are regional, spoken by one or more villages (nagari), and usually correspond to differences in customs and traditions. Each sub-village (jorong) has its own sub-dialect consisting of subtle differences which can be detected by native speakers. The Padang dialect has become the lingua franca for people of different language regions. The Minangkabau use their native language for everyday conversation, while the Indonesian language is used for most formal occasions, in education, and in writing, even to relatives and friends. The Minangkabau language was originally written using the Jawi script, an adapted Arabic alphabet. Romanization of the language dates from the 19th century, and a standardized official orthography of the language was published in 1976.
min 6,500,000 (1981) Agam, Pajokumbuh, Tanah, Si Junjung, Batu Sangkar-Pariangan, Singkarak, Orang Mamak, Ulu, Kerinci-Minangkabau, Aneuk Jamee (Jamee), Penghulu. A Minangkabau mosque circa 1900. Animism has always been important to Minangkabau culture, and the penetration of Islam into Minangkabau society in the sixteenth century did not extinguish animistic beliefs. According to the traditional Minangkabau belief system, people have two souls, a real soul and a soul which can disappear, called the semangat. Semangat represents the vitality of life and is said to be possessed by all animals and plants. An illness is sometimes explained as the capture of the semangat by an evil spirit, and a shaman (pawang) may be consulted to conjure invisible forces and bring comfort to the family. Sacrificial offerings can be made to placate the spirits, and certain objects such as amulets are used as protection. 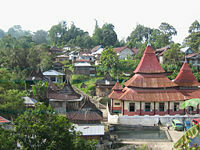 Until the rise of the Padri movement late in the eighteenth century, Islamic practices such as prayers, fasting and attendance at mosques were weakly observed in the Minangkabau highlands. The Padri, inspired by the Wahhabi movement in Mecca, sought to eliminate societal problems such tobacco and opium smoking, gambling and general anarchy by ensuring that the tenets of the Koran were strictly observed. All Minangkabau customs perceived to be in conflict with the Koran were to be abolished. Although the Padri were eventually defeated by the Dutch, during this period the relationship between adat and religion was reformulated. Adat, which had previously been based upon appropriateness and propriety, was altered to correspond more closely with Islamic precepts.The present relationship between Islam and adat is described in the saying "tradition [adat] founded upon Islamic law, Islamic law founded upon the Qur'an" (adat basandi syara', syara' basandi Kitabullah). During the 1920s, the Kaum Muda movement to reform Islam initiated widespread debate within Minangkabau over the relationship between adat and Islam.A common Minangkabau saying, adat manurun, syarak mandaki (‘custom descended, religion ascended’), refers to the perception that the Minangkabau highlands are the heartland of their culture, and that Islam entered the region from the coast. Beginning in the 14th century, Minangkabau people settled outside West Sumatra, spreading their influence to Java, Sulawesi, the Malay peninsula, Thailand, Brunei, and the Philippines. Raja Bagindo migrated to the south Philippines and founded the Sultanate of Sulu in 1390. In the 18th century, Raja Melewar was appointed the first head of state of Negeri Sembilan. Minangkabau ulama (learned men of Islam) taught Islam in Sulawesi, Borneo, and Nusa Tenggara island. The Minangkabau tradition of actively pursuing education has resulted in Minangkabau people reaching a prominence out of proportion to their small numbers in Indonesia. Many Minangkabau are politicians, writers, ulama, scientists, film producers, and businessmen. In the special Millenia edition of Tempo magazine (2000) , six of the top ten influential Indonesians of the 20th century were Minangkabau. Many Minangkabau people held prominent positions in the Indonesian and Malay nationalist movement. 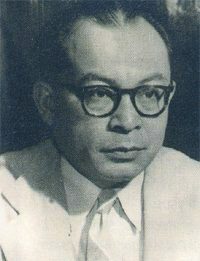 From 1920 to 1960, political leadership in Indonesia was dominated by Minangkabau such as Mohammad Hatta, a former Indonesian Prime Minister and Vice President; Muhammad Yamin, a former Indonesian government minister; Tan Malaka, international communist leader and a founder of PARI and Murba; Indonesian diplomat Agus Salim, a former Indonesian government minister; Sutan Sjahrir, a former Indonesian Prime Minister and a founder of the Socialist Party of Indonesia; and Muhammad Natsir, a former Indonesian Prime Minister and a leader of Masyumi, a major Islamic political party. Rasuna Said, an Indonesian nationalist political leader, became the first female minister in the Indonesian government. Minangkabau writers Marah Roesli, Abdul Muis, Sutan Takdir Alisjahbana, Idrus, and Hamka, and poets Muhammad Yamin, Chairil Anwar, and Taufik Ismail have made significant contributions to modern Indonesian literature. During the 16th century, Minangkabau traders were active in the medieval Malay kingdom, traveling to Aceh, Kedah, Siak, Johor, and Malacca. Today, Minangkabau businessmen are prominent in the restaurant, media, healthcare, and textile industries. People of Minangkabau descent who made significant contributions outside of Indonesia include Yusof bin Ishak, the first President of Singapore; Zubir Said, composer of the national anthem of Singapore, Majulah Singapura; Tan Sri Abdul Samad Idris, a former Malaysian Minister of Sports and Culture during the 1970s, who was also a historian of the Minang culture and a leader of the Malaysian independence movement; and World War II hero Lieutenant Adnan Bin Saidi. ↑ 7.0 7.1 7.2 Christine Dobbin, "Economic change in Minangkabau as a factor in the rise of the Padri movement, 1784-1830." Indonesia 23 (1)(1977): 1-38. ↑ Gordon, Raymond G. (2005). Ethnologue: Languages of the World (online version), Dallas, Tex. : SIL International. Retrieved 2008-05-19. Bastin, John Sturgus. 1965. The British in West Sumatra (1685-1825). Kuala Lumpur: University of Malaya Press. Blackwood, Evelyn (2000). Webs of Power: Women, Kin, and Community in a Sumatran Village. Rowman & Littlefield. ISBN 0847699110. Frey, Katherine Stenger. Journey to the land of the earth goddess. Gramedia Publishing, 1986. This page was last modified on 8 October 2018, at 18:50.